Stevie Nicks is a musical visionary, poet and songwriter with a truly controversial life story. She was not always rich and famous as she was struggling to make the ends meet at the beginning of her career, especially when tracing Stevie’s life from her Arizona childhood. 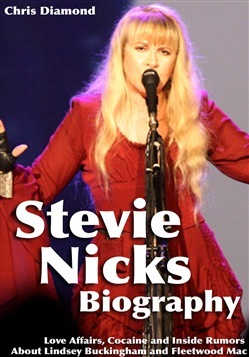 If you want to learn more about her, this biography is a revealing and inspiring portrait of Stevie Nicks. You'll also learn how she coped with all personal relationships and why things went out of hand in some, especially when she wanted to give up her career at one point. You'll also discover how she was able to cope with addictive drugs and what this cost her, and much more. Stevie's life is filled with controversies, ups and downs over the years. She's incredibly strong woman to go through all of that. All the fame, drug use, hospitals, fights with Lindsey was helping her become more mature over the years and really reframe her life in a totally positive direction. What made her a true icon? Rolling Stone claimed that Stevie Nicks was the "Queen of Rock And Roll." She accomplished everything through hard work, dedication, passion, determination, trial and errors. Any fan of Fleetwood Mac, especially during the “Rumours era" knows about the turbulent relationship of Stevie and Lindsey, but this book details the sources of the tension, including excessive drug use, Lindsey’s controlling tendencies and harsh critiques of Stevie’s songs, and even their competitiveness with each other. Take a journey with us as we bring you closer than ever to Stevie Nicks. Grab your copy now! Acquista Stevie Nicks Biography: Love Affairs, Cocaine and Inside Rumors About Lindsey Buckingham and Fleetwood Mac in Epub: dopo aver letto l’ebook Stevie Nicks Biography: Love Affairs, Cocaine and Inside Rumors About Lindsey Buckingham and Fleetwood Mac di Chris Diamond ti invitiamo a lasciarci una Recensione qui sotto: sarà utile agli utenti che non abbiano ancora letto questo libro e che vogliano avere delle opinioni altrui. L’opinione su di un libro è molto soggettiva e per questo leggere eventuali recensioni negative non ci dovrà frenare dall’acquisto, anzi dovrà spingerci ad acquistare il libro in fretta per poter dire la nostra ed eventualmente smentire quanto commentato da altri, contribuendo ad arricchire più possibile i commenti e dare sempre più spunti di confronto al pubblico online.